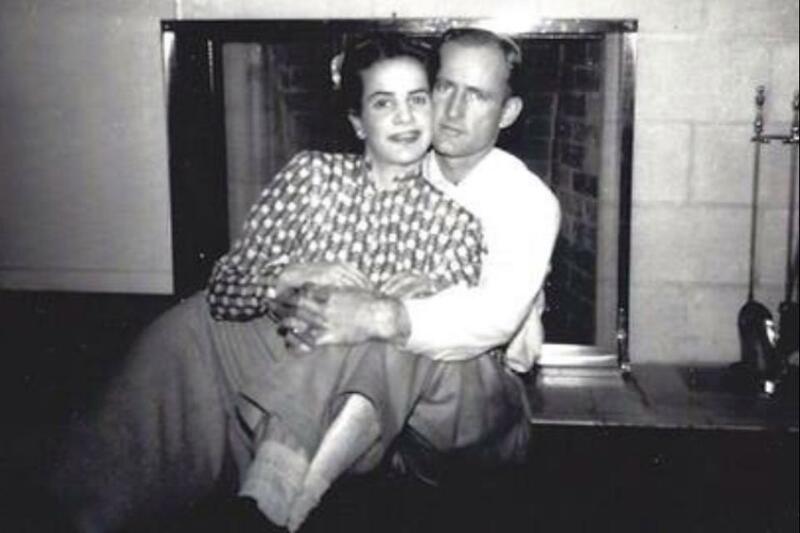 The story of how my mom and dad met would make a great Hollywood tearjerker. I’ve heard many versions of the story from many different family members. Of course, my mom’s version is the one I like, and trust, the most. My dad was assigned to a new ship shortly after WWII. I think he was a Lieutenant (junior grade) at that point, just one step up from an ensign. The ship was in New York’s harbor for a few days. It had to be 1946. My dad’s best buddy on the ship was a fellow officer from Brooklyn named Tony. Apparently, Tony had a girlfriend who lived in the outer borough but worked in Manhattan at Bergdorf Goodman on 58th & 5th. Tony and his girlfriend Angela had seen each other every day or night that the ship was in town, whenever he could manage to get shore leave. On the last day of the ship’s visit to the great city they parted, thinking they wouldn’t see each other for six whole months. But as the ship went to leave the harbor it got stuck on a sandbar. The Harbor Captain told the ship’s captain they’d have to wait until the wee hours of the next morning, at high tide, to free the hull from the bar. So Tony had one more evening to spend with his girl. He somehow contacted Angela at work and told her they could actually go on one more date before he left but that he wasn’t going to come off the ship unless she promised to bring along a nice date for his good buddy from Oregon, George. George, who was reluctant to socialize in New York City because he knew not a soul there and so had stayed on the ship the whole time it was anchored in town. Angela rushed off to find her good friend from Brooklyn, the beautiful, unattached and charming Anne, born in Park Slope, raised in Midwood, the good Catholic daughter of Italian immigrants who owned a florist shop on the corner of 4th Avenue and President Street. Anne, who took the Culver Line, the F train as it’s known today, from the County of Kings to Midtown Manhattan five days a week in order to work as a greeter at the 58th Street door of Bergdorf’s. And Anne said oh no, I have a run in my stockings, I need to wash my hair, I don’t like what I’m wearing, but she eventually gave in when she saw how much it meant to Angela to see Tony one more time. The foursome spent a night on the town and for Anne and George it was love at first sight. They wrote to each other constantly and as soon as he could get time off he came back to New York to propose. Anne said he’d have to ask her parents, who at that very moment were vacationing in Miami Beach. “Let’s go to Florida,” he said. I’m sure it was my mom’s first trip on a plane. They landed and headed straight to the hotel where my grandparents were staying. Anne and George caught up with her parents on the beach. The first thing my grandmother asked her handsome, uniformed, future son-in-law was, “Are you Catholic?” George said no, that he was Protestant, but that he would convert to marry their daughter. And he did. 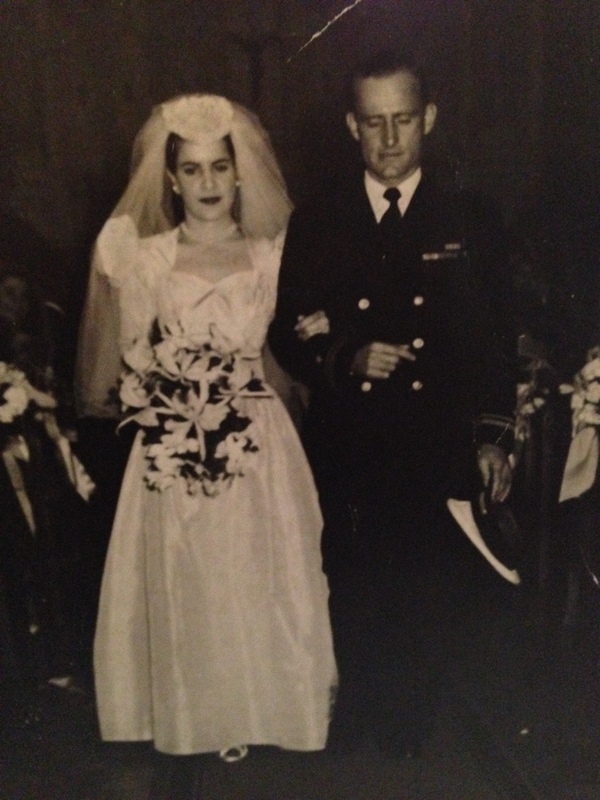 They were together as husband and wife for 13 years before the Navy chaplain from the base in Norfolk rang the bell and informed my mother that she was a widow, with three young daughters to raise. My mom sold the house in Virginia and brought her shattered family back to Brooklyn, where we lived with relatives (night Ta-Tom) until my grandparents helped her buy a house on Long Island. And once there, she met a monster.